While the latest innovations in high technology offer both benefits and challenges to the officers, it is no doubt that it has changed law enforcement completely, particularly to the field of narcotics detection. For instance, high technology has enabled Campbell/Harris Security Equipment Company (CSECO) to launch contraband detection tools which assist drug interdiction officers and anti-smuggling agents in detecting, locating and seizing illegal drugs and narcotics which have been covertly transported across the border. The company has been leading the name when it comes to contraband detection equipment, and one of their most renowned products is the CT-30 Contraband Team Detection Kit. The CT-30 Contraband Team Detection Kit used to be the ultimate contraband detection kit for every law enforcement agent, particularly the ones who are engaged in drug interdiction and anti-smuggling duties. This kit includes the following: The Buster K910B, the FV-Series Articulated Fiberscope, the PN Series Inspection Probe Kit, the Leica Laser Range Meter and the M-10 Extension Inspection Mirror with High-Intensity Flashlight, along with the custom carrying case with wheels. The CT-30 kit has been garnering praises from law enforcement and governmental bodies for being quite useful for inspections that require speed and accuracy, without leaving any room for error and the need to dismantle the materials they’re inspecting. But despite the accolades, the CSECO team still went to work to enhance the kit. The efforts of the CSECO team resulted in the CT-30’s upgrade to the newest CT-40 Contraband Team Inspection Kit. The CT-40 includes mostly the same equipment as the CT-30 has, only with the newer Buster K910G density meter and the Perfect Vision V20 Videoscope Inspection System, which replaces the FV-Series Articulated Fiberscope. The Buster K910G still retains the technology and the functionality of the older K910B – including the low-intensity gamma radiation emitter and scintillation detector, which makes for a fast and accurate scan across and over materials and locations suspected of carrying contraband. The Buster can detect and locate almost all kinds of contraband – from narcotics to explosives – through many types of materials like wood, metal, reinforced plastic and even organic material like dirt. The Buster K910G is now made safer because of two things: its all-lead-based components have been removed, and its radioactive source is now 25% smaller than that of the leading density meters. These improvements have made the Buster K910G as the safest density meter on the market just yet! Another new item on the CT-40 kit is the Perfect Vision V20 Videoscope Inspection System, which replaces the FV-Series Fiberscope. The five-inch, multi-directional LCD color display is the videoscope’s most noticeable feature – as you can see, it has no eyepiece or viewfinder as it is a typical feature in fiberscopes. The videoscope’s large display provides sharper and more detailed images as well as brighter colors of the area being inspected. It allows the user to see these images more clearly while he stays visually aware of his immediate surroundings. In using the fiberscope, on the other hand, the user must keep down when looking at the eyepiece during the inspection. This makes the user lose his visibility to his surroundings and at the same time, this also strains the eyes along the way, causing eye fatigue. Like the FV-Series Fiberscope, the Perfect Vision V20 Videoscope uses a long, thin, articulating shaft which is protected by a fuel-resistant tungsten covering. But unlike the fiberscope where you need cables to attach it to the camera, the Perfect Vision V20 Videoscope comes in one piece. And since the LCD display already provides clear still images and videos, there’s no need to use bothersome camera cables and other attachments. The most important feature of the Perfect Vision V20 Videoscope is the safety that it guarantees to the officers who are about to use it. It has complied with the safety requirements by the Underwriters Laboratory (UL), which is known the world over for testing electric products, making it certified “safe” by the organization – the first distinction achieved by any visual inspection tool. The CSECO team had worked closely with the UL to ensure that the Perfect Vision V20 Videoscope is safe to use anywhere, including hazardous areas such as gas and diesel tanks. Through the years, the CT-30 kit from CSECO has been the narcotics detection equipment that is proven useful, effective, user-friendly and safe. 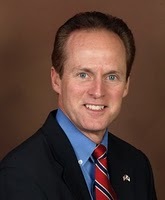 Many of the law enforcement and governmental agencies in the country have used it. Despite its equipment being considered as the best on the market, CSECO continues to improve the equipment as it continues to tackle smuggling and drug trafficking. Law enforcement officers around the country, particularly those working with contraband detection and drug interdiction, need technology they can trust. Many agencies turn to contraband detection equipment manufactured by Campbell/Harris Security Company (CSECO). CSECO receives testimonials from officers that explain how important CSECO contraband detectors are to locating and seizing illegal contraband. For instance, during a traffic stop along I-20 October, 2013, a Criminal Interdiction Officer, a member of a Mississippi task force, stopped a 2003 Toyota Tundra. The occupant of the truck acted in such a way that the officer felt the driver might be traveling with contraband in their vehicle so he requested permission to search the truck. After the driver gave permission to search the vehicle, the officer started his inspection where he noticed an area under the rear seat of the truck that stood out. 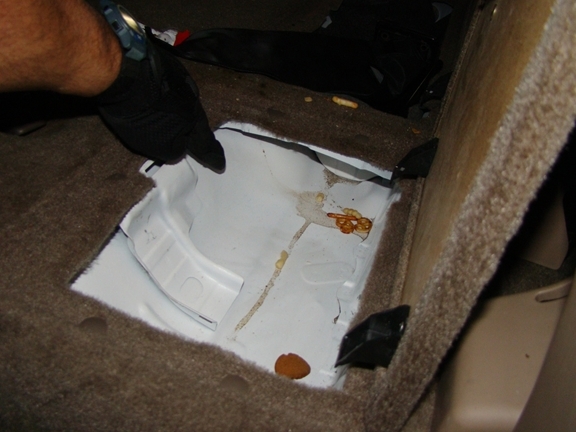 Removing the seat, the officer was able to locate a sophisticated hidden compartment under the seat. The officer chose the CSECO FV Series Fiberscope because he knew he would be able to see inside the compartment to confirm whether contraband was hidden there without having to take the vehicle apart further. The FV Series Fiberscope is made up of 16,000 individual fiber optic strands with a high-intensity light. This allowed the officer to see plastic bags hidden in the compartment. 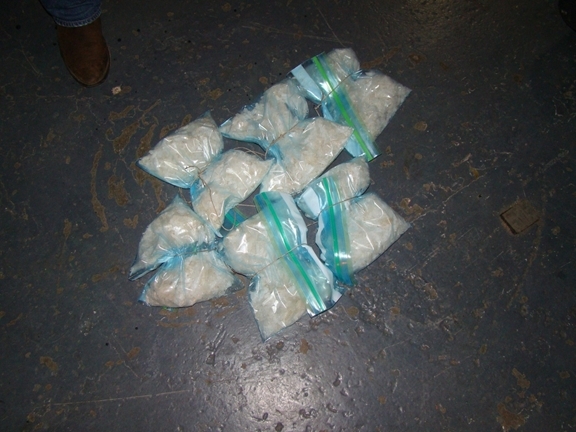 The officer suspected the bags held Crystal Meth or some other illegal substance. Accessing the compartment by removing under carriage components, the officer removed six hidden packages that weighed in around 7 pounds total. The officer stated that if he did not have the FV Series Fiberscope it is unlikely he would have been able to locate or confiscate the contraband. Along with the FV Series Fiberscope, CSECO also manufactures the Buster K910B contraband detector and density meter and CT – 30 Contraband Team Detection Kit which includes the Buster, Fiberscope and other contraband detection equipment. This equipment is able to locate hidden drugs, weapons, currency as well as being able to detect ‘dirty bombs’ and explosives. To learn more about the FV Series Fiberscope or any of the other contraband detectors manufactured and sold to federal, state and local law enforcement agencies, send an email to info@cseco.com or call 510-864-8010. CSECO has training available for all of their contraband detection equipment. 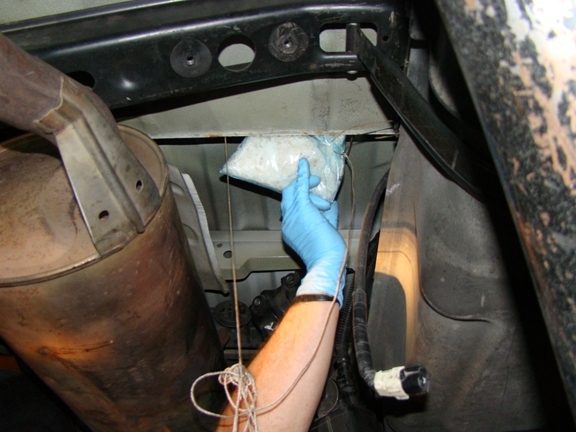 Mississippi Criminal Interdiction Officer points out suspicious area under the seat of a 2003 Toyota Tundra during a stop along I-20 in October, 2013. The officer points to a hidden compartment they located when inspecting the vehicle. 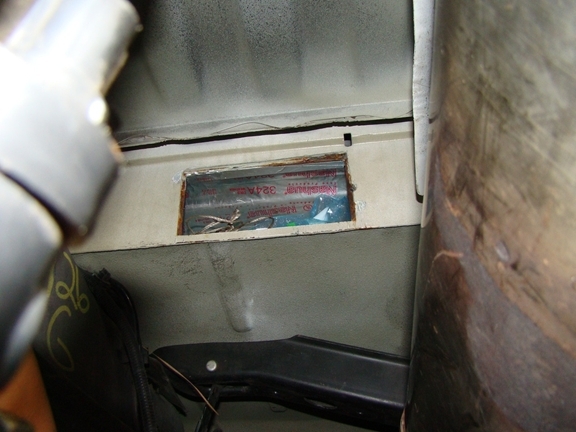 The compartment, accessible only by removing under carriage components of the truck, shows contraband hidden within. The officer begins to remove the bags containing suspected drugs from the hidden compartment. When all bags are removed from the hidden compartment, six bags weighing close to 7 pounds were seized from the compartment under the 2003 Toyota Tundra. The National Law Enforcement Officers Memorial Fund (NLEOMF) released staggering numbers to close out the year. 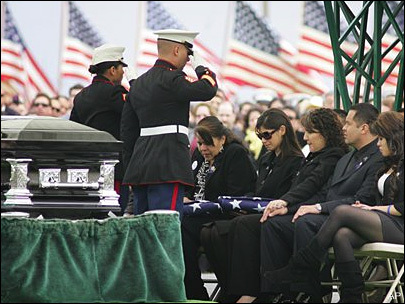 The number of police officers killed in the line of duty rose 13% from 153 in 2010 to 173 in 2011. This number is also up 23% from 2009. The report also brought attention to a frightening trend. For the first time in 14 years the leading offender, beating out the usual suspect of traffic-related deaths, was gunfire. 68 police officers were gunned down in 2011. Of the 68 deaths, 14 took place while the officer was attempting an arrest, nine occurred during a domestic disturbance call and five were ambushes. Some officials have linked these deaths to the overwhelming gun sales that have shattered records this past year. Holder also mentioned that new training regimens and programs are being put in place to stop these ongoing tragedies. One program reimbursed departments with more than $23 million for about 80,000 new stab resistant and bulletproof vests, which Holder says saved 16 lives. On the other hand, Holder hasn’t always been the most trustworthy politician when it comes to gun safety. 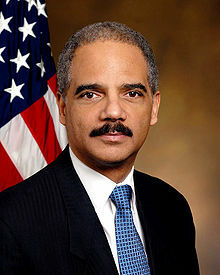 Back in 2009 Holder played a huge role in the “Fast and Furious” gun walking program. This program, according to a report by the Bureau of Alcohol, Tobacco, Firearms and Explosives (ATF), allowed at least 2,000 guns to illegally “walk” from Arizona gun stores across the border into Mexico. Only 600 have been recovered and many have been thought to be in the possession of Mexican drug cartels. The objective of the Fast and Furious program was to monitor the flow of weapons, but clearly did not go as planned. Since its start, over 200 crimes have been linked to Operation Fast and Furious including the heartbreaking death of Brian Terry.